Girls at Dhabas. 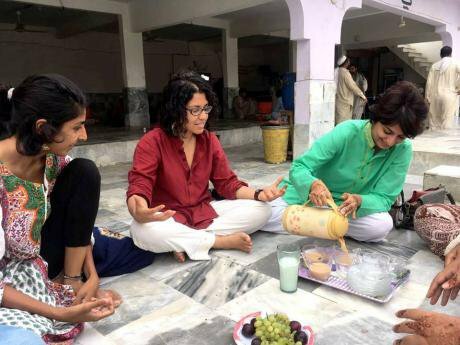 Photo: Facebook/Girls at Dhabas.We are sitting at a dhaba – a roadside tea-shop in Pakistan often frequented by lower-to-middle income men. At our table: four women and camera crew. The reporter from ‘one of the most globally viewed’ [read: western], mainstream British outlets looks me in the eye: “So, how safe do you feel at the moment? We were just surrounded by a group of little boys [because of the cameras], do you think the situation can ever turn on you?" I stare back blankly at her. I feel exhausted. I know the answer she wants – the answer her viewership perhaps wants to consume – but the response in my head is not going to satisfy the insinuations and assumptions neatly packed in the syntax of her question. I have already told her, in response to a previous question, that at most we get stares and have never had an overtly threatening encounter so far. Safety is not the issue usually on my mind. No one is really bold enough to confront someone randomly, violently, in such a crowded, busy part of town. The threat I face, that can actually result in any (self-inflicted) damage, is from my parents, relatives and their social circles. And the construction of that threat is a loss of respectability. Not safety. I don’t know if I managed to get across the weight of the nuances at hand, in those few seconds. I doubt these words even made it to the final edit of the interview. But I did lose sleep over her questions. Girls at Dhabas. 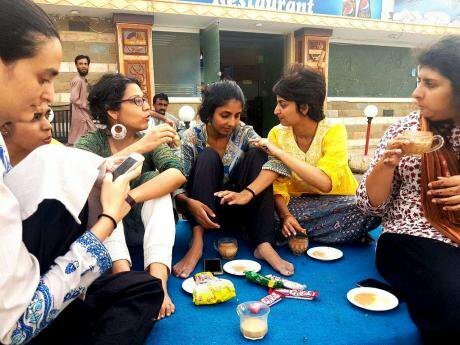 Photo: Facebook/Girls at Dhabas.I am part of a feminist collective called Girls at Dhabas, which has been actively raising conversations about women’s access to and participation in public spaces in Pakistan’s cities. These are complex issues, and we rely on personal narratives, storytelling, and social media to learn and create connections through shared experiences. The project found widespread and rapid resonance in 2015; the hashtag #GirlsatDhabas went viral, and hundreds of women shared their photos and personal stories online. The conversation covered a range of issues related to public space (including cycling and street cricket). A collective of women emerged which has been actively involved in steering the initiative and organising demonstrations, protests and dialogues on the ground. Gender and inclusive public space is one of few feminist concerns that (at some point) affects every woman. But, in extremely polarised, stratified cities, public space is contentious, and the inclusion of one marginalised group can easily mean the exclusion of another. Cultivating sensitivity, self-awareness and sisterhood is central to our politics. We know that our reach and language limits our efforts and our audience. We are aware (sometimes even hyper-aware) of how our conversations currently come from a certain level of privilege, and happen in privileged spaces. We cannot even claim that these spaces are as 'inclusive' as they are sometimes thought to be. Two years in, Girls at Dhabas still represents a starting point of sorts, but also a source of sustenance, representation and belonging for many of us involved. A version of this article originally appeared in 2016, as a personal narrative on the Girls at Dhabas' Facebook page.